Criminal justice is a diverse academic field of study, one that can train students for careers in areas ranging from law enforcement to judicial law, corrections to the court system. Maine's criminal justice schools offer students a wide range of academy, undergraduate and graduate certificate and degree options, across a variety of specializations within the legal and protective service industry. Learn more about where criminal justice schools in Maine are located, read about which programs rank towards the top of the list and compare programs, and discover potential areas of employment after graduation. After Criminal Justice School in Maine: What's Next? From small community colleges to large, four-year institutions, prospective students have a variety of educational options for their criminal justice career training in Maine. We've compiled a list of the best criminal justice schools in Maine, ranked by a blend of factors, ranging from student-teacher ratio to acceptance rate, enrollment to tuition. 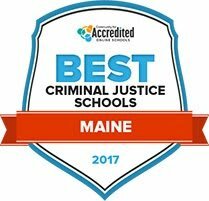 Learn more about the best criminal justice schools in Maine below. The criminal justice program at York County Community College culminates in an associate of applied science degree. Students should gain a broad understanding of the operational structure of the judiciary, correctional facilities, police organizations and public attitudes on crime and law. The degree will help prepare graduates for work in corrections, police agencies and security in the private sector. Students have access to career services, transfer services and disability services. The Learning Center provides tutoring and assistance with math, research, writing and the sciences. Guidance counselors are available to all students, as are academic and research resources in the library. The four-semester, 62-credit criminal justice program results in an associate degree. The degree should prepare students for career opportunities in forensics, law enforcement, parole/probation, corrections, security and protective services. Some students may be eligible for prior learning credits, and some high school students may be able to achieve credits before they graduate. There are many clubs and activities, and students can participate in campus activities or serve as student ambassadors or resident assistants. There are many support services available to students, including peer and faculty tutoring. Library services include group study, computer access and skills workshops. Central Maine Community College offers an associate of applied science degree in criminal justice. There are two potential tracks: criminal justice and criminal justice computer forensics. There is also a certificate in forensic investigation option. The program should prepare students for entry-level work in law enforcement or for transfer to upper-division study at a four-year university. Working professionals currently employed in the field can also complete the program to learn new skills and improve their credentials. The college is home to a fitness center and a wide range of organizations and activities, including a criminal justice club. Husson University in Bangor, Maine offers a comprehensive degree program in the criminal justice field. Students can choose from an associate degree, a bachelor's degree, dual bachelor's degree in criminal justice and psychology, dual bachelor's and master's degree (completed in five years) and the master's degree in criminal justice administration. Undergraduate seniors will attend the Maine Criminal Justice Academy to pursue certification and should be eligible for employment as a law enforcement officer upon graduation. Husson University also offers the Alpha Phi Sigma Honor Society for interested students. Through the University of Main at Augusta, students can pursue a Bachelor of Science and associate of science degree in the Justice Studies Program. The three areas of concentration in the Justice Studies Program are community policing, forensics and paralegal studies. Course work is available both on two campuses and online for distance learners. Students will prepare for careers in law enforcement, law-related paralegal positions, probation and forensics. Graduates are also eligible to pursue advanced study in law school and graduate school. In addition, the program offers a justice studies minor and an advocacy minor for non-majors interested in graduate school. The University of Main Fort Kent (UMFK) offers a unique program in conservation law enforcement, which is a four-year Bachelor of Science degree program. Unlike other colleges and universities, UMFK's program combines two specializations: wildlife conservation and law enforcement. The program prepares graduates for entry-level positions within private, federal and state wildlife sectors, including Maine Warden Service, Maine Forest Rangers, National Park Service, US Fish and Wildlife Service, USFS Conservation Law Officer, Marine Patrol, Bureau of Land Management and Conservation Law Officer. The program should take students roughly two years to complete, and classes are provided in both traditional face-to-face classroom settings and completely online. University of Maine at Presque Isle (UMPI) offers students both a Bachelor of Arts degree and an associate of arts degree within the criminal justice field. Students at UMPI complete internships with criminal justice agencies during their senior year and are required to participate in service learning activities in select courses. The Criminal Justice Club exposes students to service projects and goes on two trips every year. And students can apply for membership into the prestigious Alpha Phi Sigma honor society. Another unique aspect of the criminal justice programs at UMPI is the opportunity to present at professional conferences. A Bachelor of Arts degree in criminal justice at Saint Joseph's College in Standish, Maine, is for students who want to pursue a career in social services, judiciary and law, law enforcement, and business. Courses combine classroom instruction with field trips, demonstrations, and volunteer opportunities. Students are required to complete a full-year internship during their senior year. Curriculum should prepare interested students for graduate programs. Class sizes are small, and students have access to one-on-one faculty mentoring. In addition, the Saint Joseph's Criminal Justice Club offers other opportunities for leadership and real-life experiences. The criminal justice degree from Thomas College in Waterville, Maine places a high emphasis on real-world practical training so graduates can immediately begin employment in their field. Recent internships and field experiences have been completed at the Main Criminal Justice Academy, Interpol, the U.S. Department of Justice and the U.S. Marshals Service, just as examples. The Bachelor of Science degree from Thomas College typically takes students about four years to complete and offers programs in either criminal justice administration or just criminal justice. Graduates should be able to obtain careers in corrections, homeland security or law enforcement, and have the option of attending the 18-week basic law enforcement course at the Academy. Finding the right college that meets a student's academic needs and professional goals is important to paving the way to career success. Use the search tool below to research universities and colleges that offer criminal justice programs in Maine. Students can sort and compare institutions by multiple data points, including tuition, acceptance, enrollment levels, degrees offered and more. Students exploring criminal justice schools in Maine can learn more about different specializations of study by looking at the industry's most popular careers in the state. According to the Bureau of Labor Statistics, more than 15,000 people are working in criminal justice positions throughout the state. The boxes below show a small sample of potential career avenues in Maine, based on the most popular jobs. Students interested in attending criminal justice schools in Maine can determine the degree level required for these jobs here, as well as salary and employment information. For prospective students, choosing an academic specialization is typically informed by career opportunities after graduation. Maine's criminal justice schools offer training for a wide variety of legal, protective and security based occupations that are keeping pace with or in some cases, surpassing national averages for projected career growth and annual salaries. Scroll over the bars on the graphs below to see more details on training requirements for a variety of criminal justice positions in Maine, along with the growth projections and wage data for the state compared to the national average. In Maine, protective services and legal occupations are growing industries, with a diverse array of potential occupational opportunities for criminal justice degree holders. Students attending criminal justice schools in Maine can learn more about the areas that employ the most criminal justice professionals, and what the legal and protective service industries pay compared to one another. From law enforcement to corrections, students can find criminal justice jobs at the local, county, municipal and state level with government organizations, private law firms, security agencies and more. Use the map below to find which areas have the highest concentrations of jobs to prepare for the next steps after criminal justice school in Maine. Servicing Maine, Vermont, Massachusetts, Rhode Island and New Hampsire, the ACC offers continuing education programs and resources for in-house business law counsel in the Northeast. The Maine DECD is the state department that provides expert resources on business regulations, marketing, capital loans, investments and overall business infrastructure. A state department that oversees tax regulations and business reporting policies in Maine. The state body for business networking, the Maine State Chamber has a network of more than 5,000 companies and advocates for a regulated and fair business climate in Maine. An organization focused on providing educational opportunities to adults, the MAEA provides a program dedicated to educating adults serving time in the correctional system in Maine. The State of Maine’s official training academy for corrections officers, which includes a 200 hour training program that lasts five weeks. A state agency that manages the correctional systems, including of corrections officials and other professionals. The state department dedicated to promoting juvenile public safety and accountability through the juvenile corrections and justice system in Maine. A professional association of criminal defense lawyers that serves as a forum for discussion, professional development and promotion of the legal defense field. A membership organization for court reporters that offers information about Maine legislation, professional development and networking opportunities. A non-profit agency that provides training, public education and advocates to establish and expand restorative justice practices across the state. A public association that represents more than 3,100 Maine lawyers and serves as an advocate for the profession in the state. The Maine chapter of NALS that includes paralegal and legal support workers across four chapters in the state: Southern Maine, Midcoast Maine, Central Maine and Northeast Maine. A non-profit organization that provides legal assistance in cases that impact poverty, including food and income security, health care, transportation, housing and anti-poverty programs. An association that represents 50 local municipal associations in Maine with 1,000 members and works in legislative action for law enforcement officials. A membership based organization with 350 active and retired law enforcement officials including sheriffs, police and senior law enforcement professionals. A broad membership association that represents the interests of various law enforcement groups, such as probation officers, correctional investigators, forest rangers and game warders and capitol police in the state of Maine. A professional group that protects the lakes and watersheds in Western Maine through municipal services, water testing and monitoring, land conservation and education. The main law enforcement agency for wildlife and inland natural resources, the DIFW Warden Services page provides preservation and educational information as well as career opportunities. Maine's EEA is a non-profit organization that connects environmental professionals at the local and state level to lobby to educate and develop effective environmental industry leaders. An association of water professionals including regulatory officials, municipal operators and consultants that represents more than 125 communities and 95 wastewater treatment plants in the state.